As far as dining out goes, the past few weeks have been busier than most. You already heard about my brunch last week by Buttermilk at the James Beard House, but today it is all about Cookshop, a restaurant in the Chelsea neighborhood of Manhattan. I was pleasantly surprised to find out that Chef Marc Meyer works hard to incorporate sustainable ingredients into his dishes and is a supporter of local farmers and artisans. The freshness of the ingredients was evident right away as yummy plates were passing by. Thanks to a pre-made reservation through Open Table, my friend Kate and I were immediately seated at a table in the middle of the very busy restaurant. The Brunch menu is not extensive, but crafted with care. I was torn between the Huevos Rancheros and the Cookshop Scramble. The gentleman next to me had ordered the Scramble with Smoked Salmon and I decided on the Scramble with Applewood Smoked Bacon. Truth be told, I try not to order scrambled eggs in restaurants. I worked in a few kitchens during college and I know that scrambles and omelets sometimes start with eggs in a carton. Blech. Oh, but these eggs. Something magical is going on in the kitchen at Cookshop. The eggs were so fresh and flavorful, I had no doubt that they were straight from the shell. Inside the Scramble was a mixture of the sweetest caramelized onions I have ever tasted, creme fraiche, chives and smokey pieces of bacon. The Scramble was spilling out of a warm, homemade buttermilk biscuit. If it is possible, I am still tasting the deliciousness of that biscuit. It was so moist and tender. And sweet. Not sugary sweet, but it had a complexity of flavors from the buttermilk and butter. It was a perfect complement to the Scramble. At $14, that would have been a decent, sufficient brunch by New York standards. Cookshop took it one step further and finished off the plate with a salad. The base was a blend of arugula and other greens topped with thinly shaved rounds of carrot, radish, and parsnip tossed in a light vinaigrette. It was a perfect palate cleanser after bites of the rich eggs. My brunch date, my friend Kate (ha- that rhymes) had the Skillet Eggs. 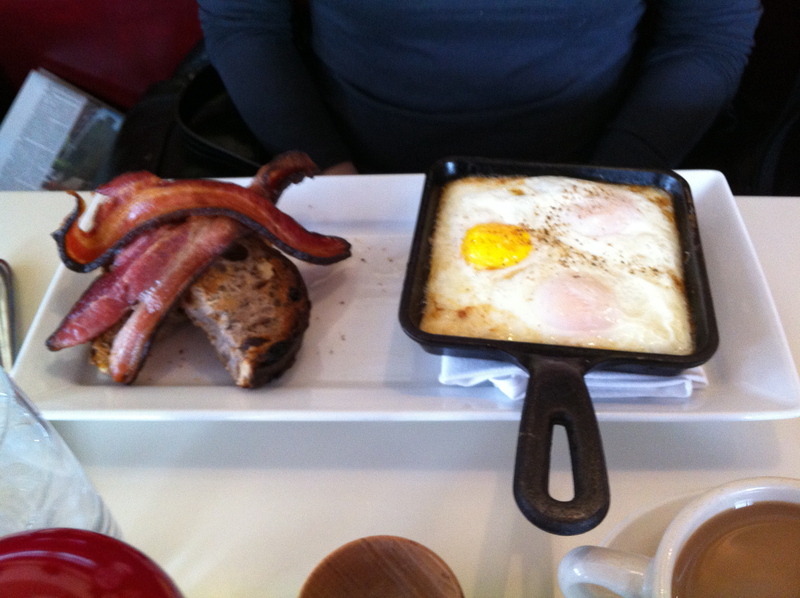 I saw the word “skillet” and figured ok, the eggs are cooked in a skillet and served on a plate. Was I impressed when the waitress brought out the dish. Anyway, the eggs were paired with house-made (are you kidding me!) grilled bacon and slices of walnut raisin toast. 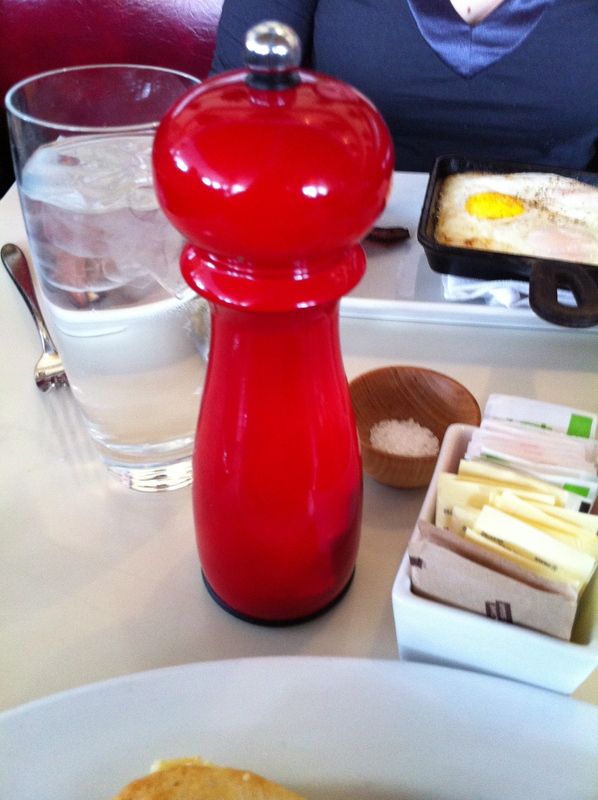 I am looking forward to another brunch trip to Cookshop, there are so many more things to try. The lady dining at the table next to me (the wife of the Smoked Salmon Scramble guy) had the Chef Salad topped with country pate and Virginia ham. And the table on the other side of us had big, fat slices of French toast, made from the same walnut raisin bread that Kate had with her eggs. I also passed a table noshing on a starter of Deviled eggs. Just image, I haven’t even made my way to the dinner menu yet! This brunch was definitely a great way to kick-off the weekend. And this post hopefully kicks-off a great week for you! Enjoy!